Background: Recurrent abortion is a difficult medical problem happening in about 1-2% of fertile women. Most spontaneous miscarriages which happen in the first and second trimesters are caused by chromosomal abnormalities. Objective: The present study tries to find the rate of chromosomal abnormalities in couples with recurrent pregnancy loss. Materials and Methods: In total 165 couples were referred to genetic counselling clinic with a history of at least three previous abortions. In all women antibodies against toxsoplasmose, rubella and cytomegalovirus (CMV) were analysed by ELIZA. In 88 couples karyotyping was conducted by analysis of G and/or C banding. 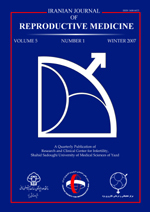 Metaphase spreads were made from phytohaemaglutinin-stimulatedperipheral lymphocytes using standard cytogenetic techniques. The chromosomal status was analyzed using CytoVision Ultra ver.4.0 from Applied Imaging. The χ2-test and ANOVA were used for statistical evaluation. The level of p<0.05 was considered as significance. Results: Most of the patients had 3 repeated abortions (61.2%). Cytogenetic analysis performed for 88 couples and karyotypes of 12.5% of them were abnormal. The majority of them had monosomy X (6.82%), followed by balanced translocation (2.27%). The number of female carries chromosomal abnormality exceeded significantly than of male. Coefficient of inbreeding in more than 50% of couples had fifth degree of relationship (89 out of 165). Conclusion: Our results showed that 12.5% of the couples withmissed abortion had an abnormal karyotype, with no otherabnormality. Cytogenetic findings in spontaneous abortedspecimens could provide valuable information for genetic counselingand prenatal care in future pregnancies in couples with a historyof repeated pregnancy loss.